Roberto Mancini was sacked by Manchester City on Monday, a year after leading the club out of the shadow of Manchester United and to their first English league title since 1968. Following is a brief summary of the highs and lows of Mancini's three and a half seasons in charge. Former Inter Milan manager Mancini took over from sacked Mark Hughes in December 2009 after the Welshman failed to deliver the kind of results expected by the club's Abu Dhabi owners after 100 million pounds were spent signing the likes of Carlos Tevez, Emmanuel Adebayor and Gareth Barry. Mancini, who ingratiated himself with fans by wearing a City scarf to go with his expensive designer suits, keept the team in the hunt for a Champions League qualifying spot. A 1-0 defeat by Tottenham Hotspur on the penultimate game of the season saw them miss out to the Londoners and they entered the Europa League instead after coming fifth. City also reached the League Cup semi-final. Mancini's first full season in charge followed another pre-season transfer splurge with Yaya Toure, David Silva and Mario Balotelli all arriving at the Etihad Stadium. 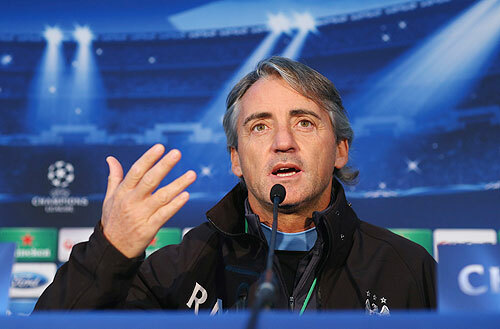 After some tricky moments in mid-season, Mancini's City began to click. They beat Manchester United in the FA Cup semi-final and went on to beat Stoke City in the final with Yaya Toure's goal ending a 35-year wait for a trophy. City never really challenged for the league title but won five of their last six matches to finish third and qualify for the Champions League. Mancini's side mounted their first real title challenge, beginning the season with a blaze of goals, but it all looked in vain as Manchester United seemed poised to hold off the challenge of the club their manager once famously described as like "noisy neighbours". However, United stumbled in the run-in and City roared back into contention, needing only to beat Queens Park Rangers on the final day of the season to clinch the title. They trailed 2-1 before an incredible late rally saw Sergio Aguero fire a stoppage time winner to seal the title for City on goal difference in one of the most dramatic days ever witnessed in the Premier League. 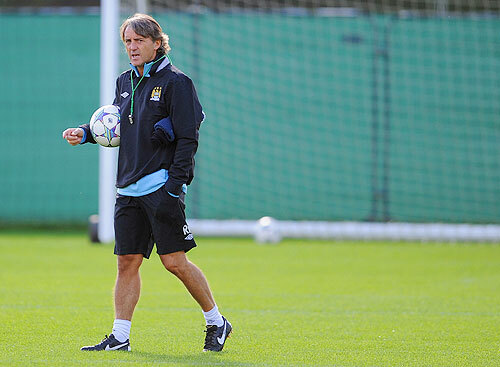 Mancini was rewarded with a lucrative five-year contract reportedly worth 25 million pounds after City's 93-goal season. City were expected to back up their first title for 44 years with another but things did not go to plan in the 2012-13 season. The goals stopped flowing, City suffered defeats to the likes of Southampton, and United took back the title with four games to spare. City couldn't even satisfy themselves with the consolation of an FA Cup triumph as they were stunned in the final by Wigan Athletic, a team put together on a shoestring budget compared to the millions of pounds spent by City. 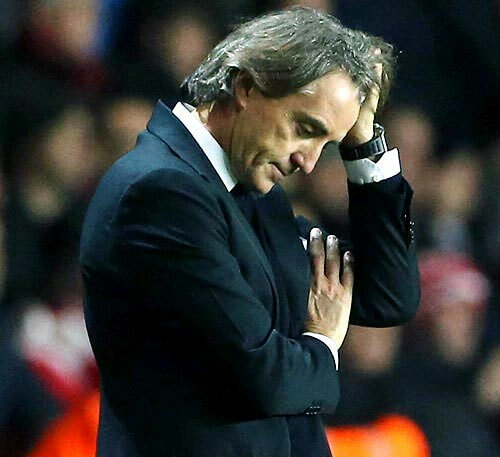 The biggest criticism of Mancini was his lack of progress in the Champions League. In City's first season (2011-12) they finished third in their group behind Bayern Munich and Napoli, failing to reach the knockout rounds. The following season was even worse. As English champions, they ended up bottom of their group behind Borussia Dortmund, Real Madrid and Ajax, picking up a woeful haul of three points. Despite a collection of world-class talent, City looked tactically naive and questions were asked about Mancini's pedigree against Europe's finest thinkers. 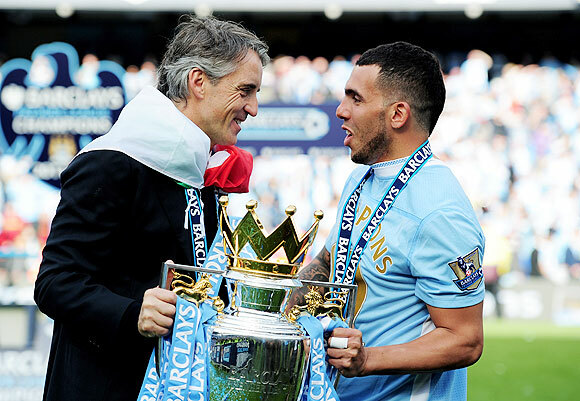 Mancini often appeared to be struggling to control a dressing room full of millionaires with large egos, as shown by the Carlos Tevez affair in the title-winning season. Tevez refused to warm-up during a Champions League match at Bayern Munich in September 2011 and Mancini said the Argentine would never play for City again. Tevez was suspended and fined by the club, pending an investigation, but returned in February 2012 after publicly apologising. The combustible Mario Balotelli's erratic behaviour also tested the authority of Mancini. He showed admirable patience, before eventually selling him in January 2013, although significantly the Italian's departure left City short in the goal scoring department. At pressurised moments, such as defeats by Southampton and Sunderland, Mancini was quick to criticise the performance of some of his senior players such as Joe Hart and Samir Nasri for mistakes, something United's Alex Ferguson or Arsenal's Arsene Wenger never do in public. 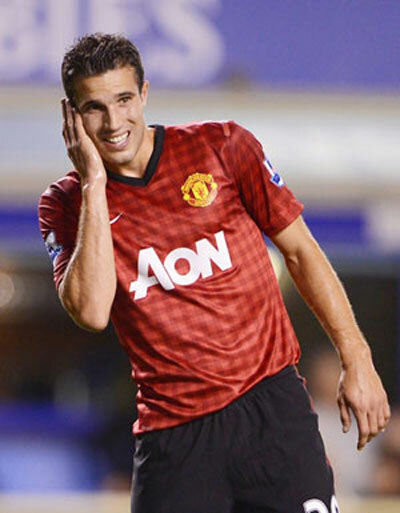 Before the defence of their Premier League crown Mancini was clearly keen to sign Arsenal's Robin Van Persie but was beaten to his signature by Ferguson and he was not shy in making public his frustrations with the club's transfer policy. It proved a key moment in the title race as the Dutchman scored 25 league goals for United as they seal a 20th title with ease. 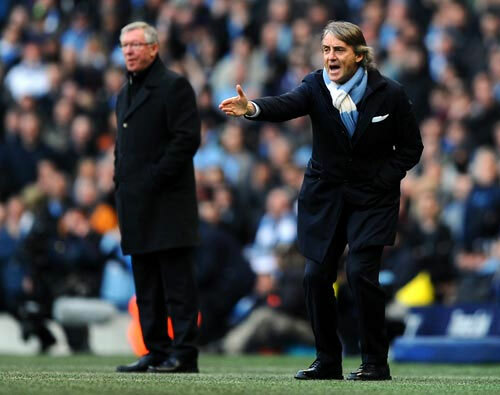 EPL: City to dismiss Mancini and bring in Pellegrini?